Very easy to put together and tasty! Make the dip: Blend the heavy cream in a blender until slightly thickened. Add the sour cream, lemon juice, blue cheese, scallions and garlic powder and pulse to combine. Season with salt and pepper. Cover and chill 2 hours. Make the chips: Heat 1 to 2 inches vegetable oil in a large pot over medium heat until a deep-fry thermometer registers 350 degrees F. Rest a cooling rack on a baking sheet lined with paper towels. Spread some flour in a baking dish, add the beet slices and toss. Tap off the excess flour, then fry the beets in batches (don't overcrowd the pot), stirring occasionally to make sure they don't stick to each other, 3 to 5 minutes, or until the fizzling around the chips slows down. Transfer the chips with a slotted spoon to the rack and season with salt. Let cool at least 5 minutes; the chips will crisp up as they cool. Return the oil to 350 degrees F between batches. Replenish the oil, if necessary, and return to 350 degrees F. Dredge the sweet potato slices in flour and fry in batches, stirring, 2 to 3 minutes. Transfer to the rack, season with salt and let cool. 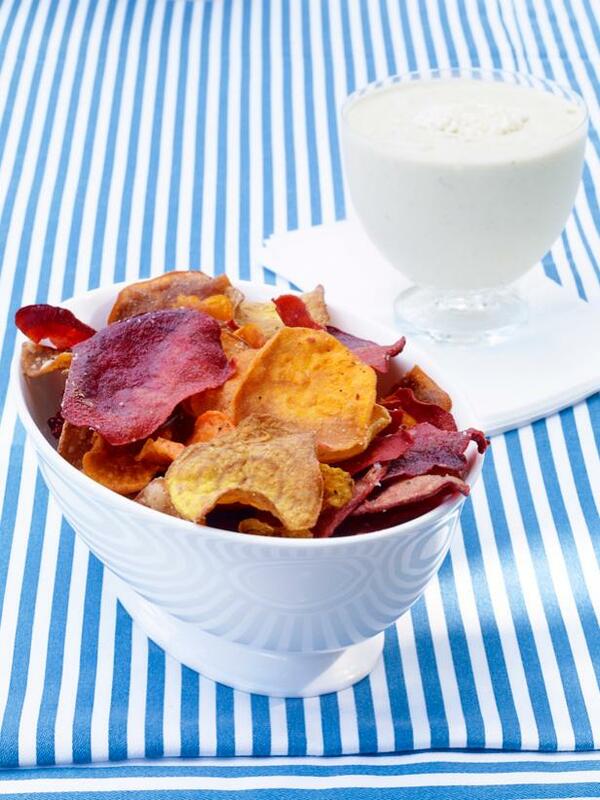 Serve the chips with the blue-cheese dip.